These are important life skills and attitudes which support children in being ready to face challenges, explore and extend their learning. 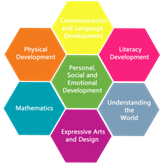 All of the activities planned within our EYFS key stage are linked to these areas of learning with close attention paid to the characteristics of effective learning. What’s happening this term in Reception? Happy New Year to all our families! Welcome back to a brand new term. All of our wonderful children have enjoyed settling back into our routine and have had a very busy and exciting start to the year. This week we have started our new topic based around our core text ‘The Bog Baby’ by Jeanne Willis. The children have been learning all about the setting of the story and have spent some time researching ponds and rivers. As part of our learning we are hoping to visit a local river bank in the hope of exploring this further. More information about this will be sent home. We cannot wait to explore the story of ‘The Bog Baby’ even further. Please keep checking Tapestry to find out more about our learning. In phonics we will be revisiting all Phase 2 letter sounds and key words before starting to deliver Phase 3 phonics where we will be introducing new sounds, including sounds which are made up of two letters – digraphs. Letter sounds and key words will be sent home in reading folders each week along with Reception High Frequency Words and a reading book. Please ensure you regularly practise these sounds and key words with your child along with reading often. This term in mathematics we have started to learn about 2D and 3D shapes. We have learnt the different names of lots of shapes and have been able to talk about the properties of shapes too. We have enjoyed making models using 3D shapes and searching for shapes in our outdoor environment. As we continue through the term we will be focusing on Measures, introducing the children to length, weight and capacity. In Come and See we are learning about Celebrations. During this topic we will be talking about different celebrations and festivals. We would like to invite families to learn a little more about our work in Come and See by attending our class assembly on Thursday 31st January 2019 at 2.00pm. Snack money is to be paid each Monday – £1.00 per week. Tapestry is used daily by staff to record children’s learning. Please try to log in regularly to access your children’s achievements and successes and inform us of any out of school activities. Many thanks for your continued support in school and at home.